Step by Step Guide on How to Convert as well as Download YouTube to iPhone 5/5S/5C/4S/4/3GS on Mac or Windows. Though iPhone 5 represents the first major revision of the iPhone's screen size (from 3.5-inch to 4 inches) which lets widescreen movies fit better, it still refuse to allow Flash technology on its device. Though we can play YouTube on iPhone with the YouTube app which comes preinstalled on the iPhone 5/4S/4/3GS/3G, it need Wi-Fi connection, even so, it often happens that YouTube videos won't play on iPhone. In order to solve "YouTube not working on iPhone 5S/5C/5/4S/4/3GS" problem, a recommended solution is to download and convert YouTube to iPhone supported format so as to successfully play YouTube on iPhone even without YouTube app and Wi-Fi connection. The following article will introduce a powerful YouTube to iPhone Converter and Downloader as well as a step by step guide on how to convert and download YouTube to iPhone. Then it is that easy to play all kinds of YouTube movies or music on iPhone 5S, iPhone 5C, iPhone 5, iPhone 4S, iPhone 4, iPhone 3GS, iPhone 3G. 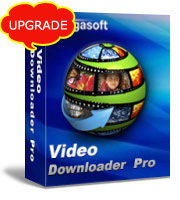 Bigasoft Video Downloader Pro, the professional YouTube Downloader for iPhone and YouTube Converter for iPhone, can fast download as well as convert YouTube to iPhone supported format on Mac or Windows for sync and play YouTube on iPhone 5S/5C/5/4S/4/3GS/3G. This powerful YouTube to iPhone Converter and Downloader applies to: fast download and convert YouTube video FLV, F4V, WebM, and H.264 to iPhone supported MP4, MOV or M4V format; easily convert and download YouTube Audio to iPhone supported MP3, M4A, AIFF or AAC; only download YouTube music from YouTube music video and then convert YouTube to iPhone supported audio format. Aside from convert and download YouTube to iPhone, this powerful YouTube Downloader for iPhone also helps to convert other video or audio to iPhone compatible format to successfully play AVI, MKV, WMV, FLV, F4V, VOB, WTV, MPG, MXF, MVI, BIK, 3GP, 3GPP, MOV, MP4, SWF, ASF, AVCHD, FLAC, OGG, WMA, APE, SHN, QCP and etc on iPhone 5S, iPhone 5C, iPhone 5, iPhone 4S, iPhone 4, iPhone 3GS, iPhone 3G. Moreover, it also supports download and convert various video or audio to iPad, iPod, iTunes, Apple TV, QuickTime, iDVD, iMovie, FCE, FCP and FCP X compatible format. How to Convert and Download YouTube to iPhone to Play YouTube on iPhone? 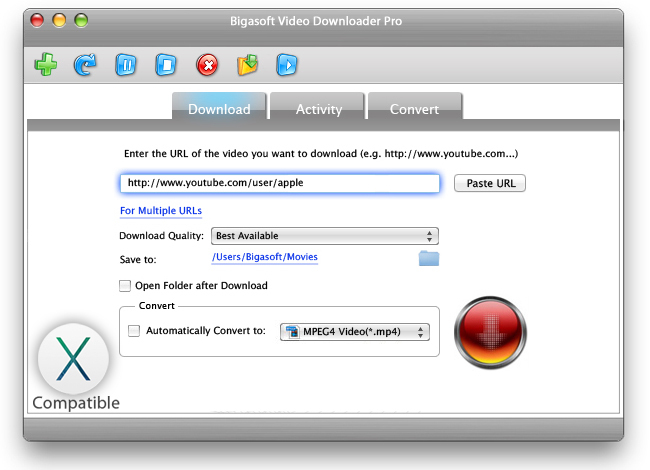 Free download the all-in-one YouTube to iPhone Converter and Downloader - Bigasoft Video Downloader Pro (Mac Version, Windows Version), install and run it, the Download panel will pop up as follow. To download and convert YouTube to iPhone 5 video format, select iPhone 5 H.264 Video(*.mp4) from "iPhone" category. To only convert and download YouTube movies or music to iPhone 5 audio format, select MP3, M4A or AIFF the "General Audio" category. 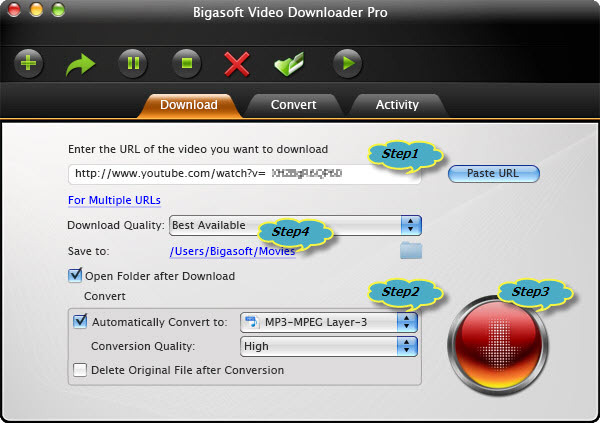 To convert and download YouTube to iPad, iPod, Apple TV, Android, PS3, PSP, select the desired output video format from the corresponding category. Click the "Download" button to start downloading and converting YouTube to iPhone 5 supported format, it will be finished with fast converting and downloading speed. After downloading and converting YouTube to iPhone 5 supported video or audio format, click the "Save to: " destination folder link to open the "Convert" folder to drag and drop the converted YouTube files to iTunes for syncing to iPhone 5. Then just play YouTube on iPhone 5 with the stunning new 4-inch Retina display. Tips: How to Convert Other Video/Audio to iPhone 5 Supported Format?